Be the first to share your favorite memory, photo or story of Sarah (Sally). This memorial page is dedicated for family, friends and future generations to celebrate the life of their loved one. Sarah B. 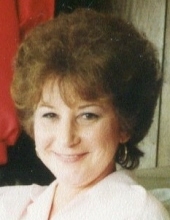 (Sally) Smith, 77, went to be with her Lord on Monday, January 21, 2019. She was born and raised in Momence, Illinois on March 29, 1941, the daughter of Arthur E. and Sarah Yott Petro. She moved to Southern Indiana in 1973. She worked and retired from Indiana Utilities in Corydon after 24 years of service. She was a member of Lincoln Hills Christian church in Corydon and loved camping, fishing and being with family and friends. She was preceded in death by her parents and 3 brothers. A memorial visitation will be held 2-8 PM on Friday, January 25, 2019 at Gehlbach & Royse Funeral Home in Corydon. Interment will be in Central Kentucky Veterans Cemetery in Radcliff, Ky at a later date. To send flowers or a remembrance gift to the family of Sarah (Sally) Smith, please visit our Tribute Store. "Email Address" would like to share the life celebration of Sarah (Sally) Smith. Click on the "link" to go to share a favorite memory or leave a condolence message for the family.